It’s the end of the boating season, and now is the perfect time to consider all of the maintenance you have been wanting to get done on your boat but have not had the time to get around to it. Even if you are not winterizing just yet, preventive maintenance is an excellent habit to get into. But pulling your boat out of the water and then putting it back in again…and then repeating this process after every maintenance job is finished, just wastes time and money. Consider our boat storage options to solve this problem. Here are four maintenance tasks you might be considering undertaking and how our storage options can make it so much easier. Your craft weathers harsh conditions on a daily basis. Algae accumulate, slowing your boat down and clogging important engine parts, propellers, and more. 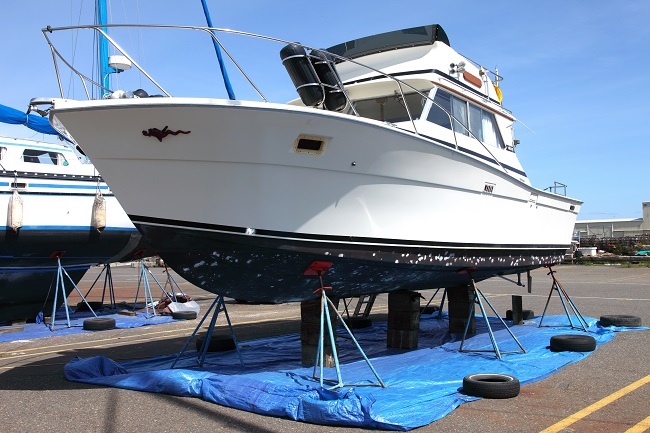 Pull your boat out and store it with us in one of our uncovered, enclosed, or covered options and then take your time arranging for the painting to begin. You don’t have to worry about trying to time pulling it out and then bringing it to the painting location. It is darn hard to wax your boat when it is in the water. But pulling it out gives you access to every angle, allowing you to wax and polish to your heart’s content. And, if you do bottom painting first, then you will have one fine looking vessel to put back into the water come boating season. When you pull your boat out, you can use this opportunity to check for water tightness. You simply cannot check these below water hull openings when the boat is in the water. Additionally, confirming the proper operation and functioning of all engine and exhaust openings will help keep your engine running smoothly. Also, checking the stuffing box for leakage is another important step to take. Speed and depth sensors are often neglected too. Another maintenance check is directed towards sailboats. It concerns rust. It is important to check where the rigging and stays are attached to the chain plates. This is yet one more maintenance act that is just easier to check off your list when the boat is on dry ground. This list hardly covers all the maintenance task you might undertake for your boat. But it does help you get started. Regular maintenance of your boat is critical to long-term usage. But a boat in the water limits the amount of work you can do on it. Easy access to those hard-to-reach areas is solved by pulling the boat out of the water. But sometimes, you are not ready to take on all the projects you need to do. When you utilize our storage options, you are free to arrange your maintenance tasks on your time, all while knowing that your craft is safe and protected in our facility. 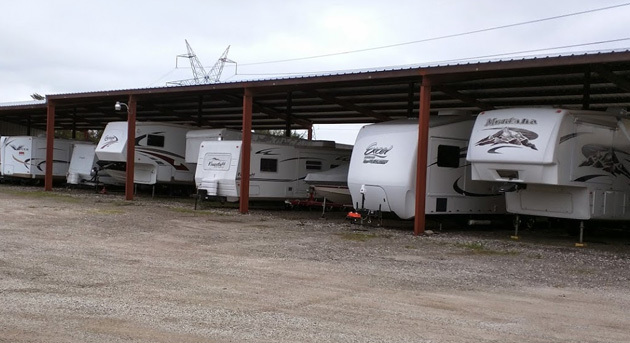 Party Barn Boat & RV Storage also offers a gate and code entry system for extra protection. Whether you need quick access uncovered storage or desire more protection with our covered or enclosed options, check us out! Contact us to find the perfect storage choice for your boat! Indoor or Enclosed Storage: What’s Right for You? Here in Texas, we like to hold on to warm weather thoughts as long as we can. But now that winter has officially been ushered in, you might find yourself scrambling for where and how to store your RV during these chillier months. You know you don’t want it sitting in your driveway, but what are your options? Open parking. Here, your RV gets parked in a designated parking space in an uncovered area. Covered parking. Here, your RV gets parked in a covered space similar to a massive carport. This protects it from the worst of rain and UV damage, as well as the rare hail storm. However, with both outdoor storage options, there are no walls to protect vehicles from all types of elemental damages. Even prolonged sun exposure can have negative impacts on your RV. While it is a bit more expensive, more people than ever are requesting enclosed storage facilities. That’s because here your recreational investment enjoys the highest amount of protection in a fully enclosed parking space. This adds an extra layer of security while climate-controlled facilities further protect sensitive electronic and piping components and four walls + a roof keeps out all of the elemental damage. For more information about enclosed storage and why it is the hot trending storage pick for boats, and trailers, contact us today.